Qipao, a traditional Chinese dress for women that first came into vogue in the 1920s, accentuates the gracefulness of the feminine physique with its oriental charm. How has Qipao emerged from the 1920s to the 1970s? This set of six stamps, together with the stamp sheetlets, exhibits the special characteristics of the Chinese Traditional dresses from different decades. Furthermore, illustrations on the stamps are the works of students studying for the Higher Diploma in Visual Arts and Culture at the Hong Kong Design Institute. The stamp sheetlets are embedded with the first-ever dress-shaped stamps. Furthermore, the HK$20 stamp sheetlet is printed with paper made of taffeta fabric to enhance the theme. HK$1.70 (Qipao in the 1920s) ─ The dresses inherited the wide and straight cut of long gowns of the Qing dynasty. Hemline fell between the calf and the ankle while the sleeves reached either the wrist or the elbow. HK$2.20 (1930s) ─ became the most popular daily attire among women. The qipao at that time mostly adopted a slim and slender cut, with higher slits on both sides to allow easier movements. HK$2.90 (1940s) ─ had its hemline raised to the calf and the collar lowered. The dresses were made of plainer fabrics with few embellishments. Summer qipao dresses were largely sleeveless. HK$3.10 (1950s) – characterised by a slender cut, an indented hem and a higher collar. The qipao became probably the most elegant and decent dress for women for going out and the mainstream work attire for office ladies. HK$3.70 (1960s) – bore a similar style to that of the 1950s: shortened length, a slim waistline, a body-hugging fit and a narrow hemline to create an hourglass figure. HK$5 (1970s) – gradually fell from grace as western outfits won hearts. Nevertheless, the qipao continued to be worn as a ceremonial dress and thus became the attire for special occasions. 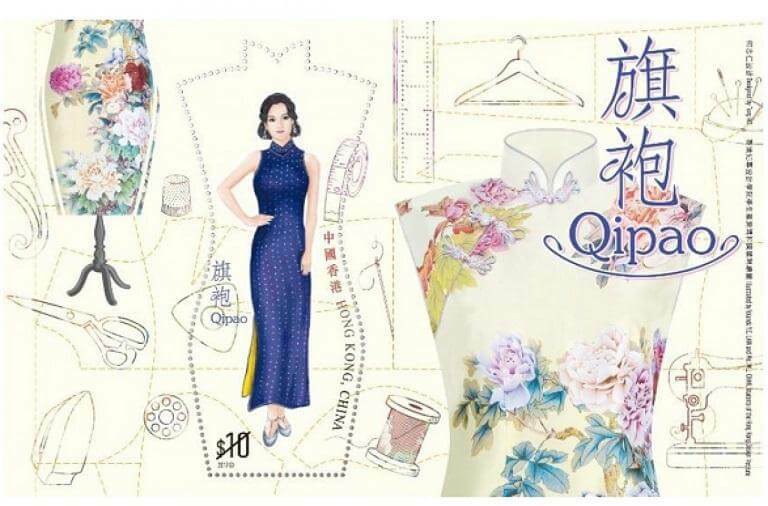 HK$10 Stamp Sheetlet – Contemporary qipao has retained the classical design while undergoing refinement and recasting by introducing contemporary fashion elements into the fabrics, cut and styles, hence reinforcing its prestigious status as a perennial classic. Stamp products include mint stamps, stamp sheets, stamp sheetlet (containing a HK$10 stamp), stamp sheetlet, mini-pane, prestige stamp booklet and also presentation pack. Most noteworthy, the stamp sheetlet contains a HK$20 stamp, printed with paper made of taffeta fabric. In addition, serviced first day covers are also available at the philatelic offices on the issue day only. A hand-back date-stamping service using the office steel date-stamp and the special postmark will be provided on 17 October 2017 at all post offices for official/privately-made covers bearing the first day of issue indication and a local address. All philatelic offices will also provide hand-back date-stamping service using the “Philatelic Bureau” pictorial postmark and the philatelic office pictorial postmark concurrently. The GPO-1 date-stamp will only be available at General Post Office. Moreover, all stamp products will be available starting from 17 October 2017 for three months while stock lasts. Last but not least, the stamp products will be available at Hongkong Post “ShopThruPost” starting from 17 October 2017 while stock lasts.